Optics and photonics are key technologies in most strategic sectors, both for the advances of fundamental research and for the variety of application areas. In the past years, the possibility to functionalise and to engineer materials and components at nanometer scale opened up opportunities for new applications and new ways of radiation-matter interaction. The growing integration of chips on photonic devices will allow overcoming the intrinsic limitations in elaborating, transmitting and sharing information related to specific environments (e.g. : internet of things). In addition to these important potentialities, quantum technologies offer further opportunities to exploit the control of matter constituents and the quantum mechanics laws permitting to achieve performances incomparable to those based on classical systems. Optical technologies will contribute to tackle fundamental problems such as the Planet sustainable growth through the exemplary change in the systems for energy production and environmental parameters measurement. Optical and photonic systems, multiparameter sensors networks and optoelectronic infrastructures (such as for Smart Cities e Smart Buildings). Photonic technologies for high efficiency energy production, conversion, storage and transportation. Photonic technologies for virtual reality, cognitive photonics and advanced man-machine interfaces. Photonic systems for advanced imaging, non-invasive diagnostics, living matter therapy and manipulation. Dissemination of ultra-precise time and frequency standards. Photonic technologies for the study of matter in extreme conditions (such as new materials synthesis, plasmas, nuclear fusion and charges acceleration). Advanced platforms based on photons and ultra-cold matter for communication networks, simulators and quantum computing. Quantum sensors for high precision time metrology, gravity, electromagnetic fields and physical properties of matter. Superfluidity – the suppression of scattering in a quantum fluid at velocities below a critical value – is one of the most striking manifestations of the collective behaviour typical of Bose–observed only at prohibitively low cryogenic temperatures. For atoms, this limit is imposed by the small thermal de Broglie wavelength, which is inversely related to the particle mass. Even in the case of ultralight quasiparticles such as exciton–polaritons, superfluidity has been demonstrated by the small binding energy of Wannier–Mott excitons, which sets the upper temperature limit. Here we demonstrate a transition from supersonic to superfluid flow in a polariton condensate under ambient conditions. This is achieved by using an organic microcavity supporting stable Frenkel exciton–polaritons at room temperature. This result paves the way not only for tabletop studies of quantum hydrodynamics, but also for room–temperature polariton devices that can be robustly protected from scattering. We have monitored the Landau–Zener dynamics of a single–ion magnet inserted into a spin–transistor geometry. For increasing field–sweep rates, the spin reversal probability shows increasing deviations from that of a closed system. In the low–conductance limit, such deviations were shown to result from a dephasing process. In particular, the observed behaviors were successfully simulated by means of an adiabatic master equation, with time averaged dephasing (Lindblad) operators. The time average was tentatively interpreted in terms of the finite time resolution of the continuous measurement. Diamond’s nitrogen vacancy (NV) center is an optically active defect with long spin coherence times, showing great potential for both efficient nanoscale magnetometry and quantum information processing schemes with room temperature operations. In an international collaborative endeavour led by CNR-IFN Milano, femtosecond laser writing has been shown as a powerful tool for both the formation of buried 3D optical components and single NVs in the bulk of diamond. Recently, an integrated device consisting of laser-written photonic waveguides in ultrapure diamond aligned to sub-micron resolution to single laser-written NVs have been realized. 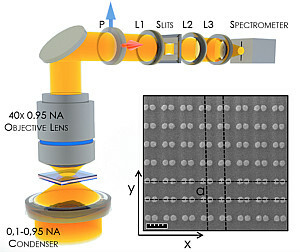 Laser written optical waveguides have been used to excite and collect photoluminescence signal from single NVs. 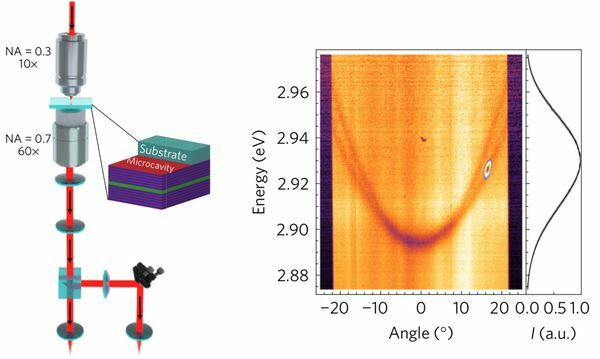 The results obtained paves the way towards complex integrated diamond quantum devices with optically connected single photons from NVs for spin-based magnetic, electric and thermal sensing. The Berezinskii–Kosterlitz–Thouless phase transition from a disordered to a quasi-ordered state, mediated by the proliferation of topological defects in two dimensions, governs seemingly remote physical systems ranging from liquid helium, ultracold atoms and superconducting thin films to ensembles of spins. We have observed such a transition in a short–lived gas of exciton–polaritons, bosonic light–matter particles in semiconductor microcavities. The observed quasi–ordered phase, characteristic for an equilibrium two–dimensional bosonic gas, with a decay of coherence in both spatial and temporal domains with the same algebraic exponent, is reproduced with numerical solutions of stochastic dynamics, proving that the mechanism of pairing of the topological defects (vortices) is responsible for the transition to the algebraic order. This is made possible thanks to long polariton lifetimes in high–quality samples and in a reservoir–free region. Our results show that the joint measurement of coherence both in space and time is required to characterize driven–dissipative phase transitions and enable the investigation of topological ordering in open systems. We have reported the first experimental realization of a thermal Josephson junction whose phase bias can be controlled from 0 to π. This is obtained thanks to a superconducting quantum interferometer that allows full control of the direction of the coherent energy transfer through the junction. This possibility, in conjunction with the completely superconducting nature of our system, provides temperature modulations with an unprecedented amplitude of about 100 mK and transfer coefficients exceeding 1 K per flux quantum at 25 mK. Then, this quantum structure represents a fundamental step towards the realization of caloritronic logic components such as thermal transistors, switches and memory devices. These elements, combined with heat interferometers and diodes, would complete the thermal conversion of the most important phase–coherent electronic devices and benefit cryogenic microcircuits requiring energy management, such as quantum computing architectures and radiation sensors. We have investigated how one can realize a photonic device that combines synthetic dimensions and synthetic magnetic fields with spatially local interactions. Using an array of ring cavities, the angular coordinate around each cavity spans the synthetic dimension. The synthetic magnetic field arises from the circumstance that intercavity photon hopping is associated with a change of angular momentum. Photon-photon interactions are local in the periodic angular coordinate around each cavity. We have also pointed out experimentally observable consequences of the synthetic magnetic field and of the local interactions. Combining localized surface plasmons (LSPs) and diffractive surface waves (DSWs) in metallic nanoparticle gratings leads to the emergence of collective hybrid plasmonic–photonic modes known as surface lattice resonances (SLRs). These show reduced losses and therefore a higher Q factor with respect to pure LSPs, at the price of larger volumes V. By using aluminum nanoparticle square gratings with unit cells consisting of narrow–gap disk dimers (a geometry featuring a very small modal volume) we have demonstrated that an enhancement of the Q/V ratio with respect to the pure LSP and DSW is obtained for SLRs with a well–defined degree of plasmon hybridization. Simultaneously, we have reported a 5 times increase of the Q/V ratio for the gap–coupled LSP with respect to that of the single nanoparticle. The results of this work open the way toward more efficient applications for the exploitation of excitonic nonlinearities in hybrid plasmonic platforms. We employ radio–frequency spectroscopy to investigate a polarized spin mixture of ultracold 6Li atoms close to a broad Feshbach scattering resonance. 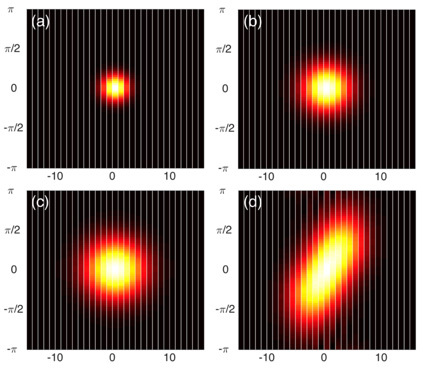 Focusing on the regime of strong repulsive interactions, we observe well-defined coherent quasiparticles even for unitarity–limited interactions. We characterize the many-body system by extracting the key properties of repulsive Fermi polarons: the energy E+, the effective mass m*, the residue Z, and the decay rate Γ. Above a critical interaction, E+ is found to exceed the Fermi energy of the bath, while m* diverges and even turns negative, thereby indicating that the repulsive Fermi liquid state becomes energetically and thermodynamically unstable. We have reported three dimensional triple–helical nanowires, engineered by the innovative tomographic rotatory growth, on the basis of focused ion beam-induced deposition. These three dimensional nanostructures show up to 37% of circular dichroism in a broad range (500–1,000 nm), with a high signal-to-noise ratio (up to 24 dB). Optical activity of up to 8° only due to the circular birefringence is also shown, tracing the way towards chiral photonic devices that can be integrated in optical nanocircuits to modulate the visible light polarization. We have realized the first balanced Josephson heat modulator designed to offer full control at the nanoscale over the phase-coherent component of thermal currents. Our device provides magnetic–flux–dependent temperature modulations up to 40 mK in amplitude with a maximum of the flux–to–temperature transfer coefficient reaching 200 mK per flux quantum at a bath temperature of 25 mK. Foremost, it demonstrates the exact correspondence in the phase engineering of charge and heat currents, breaking ground for advanced caloritronic nanodevices such as thermal splitters, heat pumps and time–dependent electronic engines. We have reported on the observation of the Josephson effect between two fermionic superfluids coupled through a thin tunneling barrier. 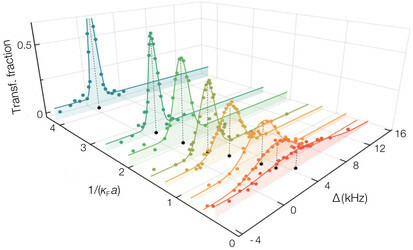 We have shown that the relative population and phase are canonically conjugate dynamical variables throughout the crossover from the molecular Bose-Einstein condensate (BEC) to the Bardeen–Cooper–Schrieffer (BCS) superfluid regime. For larger initial excitations from equilibrium, the dynamics of the superfluids become dissipative, which we ascribe to the propagation of vortices through the superfluid bulk. Our results highlight the robust nature of resonant superfluids.